(Jan 21): Wall Street's recent selloff deepened on Wednesday, with the S&P 500 closing at its lowest in over a year as U.S. oil prices plummeted to 2003 lows. The equities rout was widespread, hitting nine of the 10 major S&P sectors. The small-cap Russell's 2000 index fell 3.6 percent before reversing its loss late in the session. The beaten-down S&P energy sector fell 2.93 percent, leading the losers. Exxon dropped 4.21 percent and Chevron slumped 3.10 percent. Collapsing oil prices and fears of a slowdown in China, the world's second largest economy and a key market for U.S. companies, have led the S&P 500 to drop 9 percent this year. In the past six months, the energy sector has fallen 26 percent. "The fear is, 'Is tomorrow going to bring more selling?' People are not even thinking about today, they're thinking about tomorrow," said Kim Forrest, senior equity research analyst at Fort Pitt Capital Group in Pittsburgh. U.S. crude sank 6.6 percent on Wednesday as a supply glut bumped up against bearish financial reports that deepened worries over demand. But a late-day bounce in U.S. oil prices helped reduce losses in stocks. 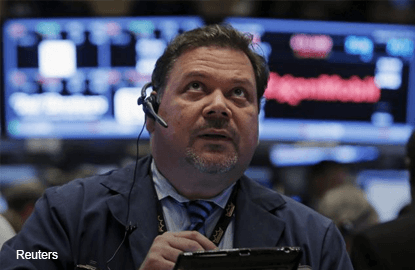 "If you look at crude prices, they are shooting right back up," Randy Frederick, managing director of trading and derivatives for Charles Schwab in Austin, said ahead of the close. The S&P 500 ended down 1.17 percent at 1,859.33, its lowest close since October 2014. It had fallen as low as 1,812.29. The Dow Jones industrial average ended 1.56 percent lower at 15,766.74 points. After a brief late-day rally into positive territory, the Nasdaq Composite lost steam and ended down 0.12 percent at 4,471.69. The CBOE volatility index, Wall Street's fear gauge, jumped 5.9 percent to 27.59. Strength last year in Netflix, Facebook and a handful of other technology stocks masked troubled sentiment in other S&P 500 components, said R Squared portfolio manager Riad Younes. "You had a crowded trade on a few names that kept the average much higher than it should be," Younes said. "It feels like a bear market for the average stock." IBM weighed the most on the Dow, falling 4.88 percent after disappointing earnings report. Netflix ended down 0.14 percent despite better-than-expected growth in its subscriber base. An unusually high 12.5 billion shares changed hands on U.S. exchanges, well above the 7.8 billion daily average for the past 20 trading days, according to Thomson Reuters data. The New York Stock Exchange recorded 2,271 stocks advancing stocks and 883 decliners. On the Nasdaq, 1,551 issues fell and 1,331 advanced. The S&P 500 posted no new 52-week highs and 182 new lows; the Nasdaq recorded 5 new highs and 728 new lows.